Mixing up a few Hawaiian drink recipes is a fun and fabulous way to spice up your party, whether you're in a tropical location or high in the snowy mountains. 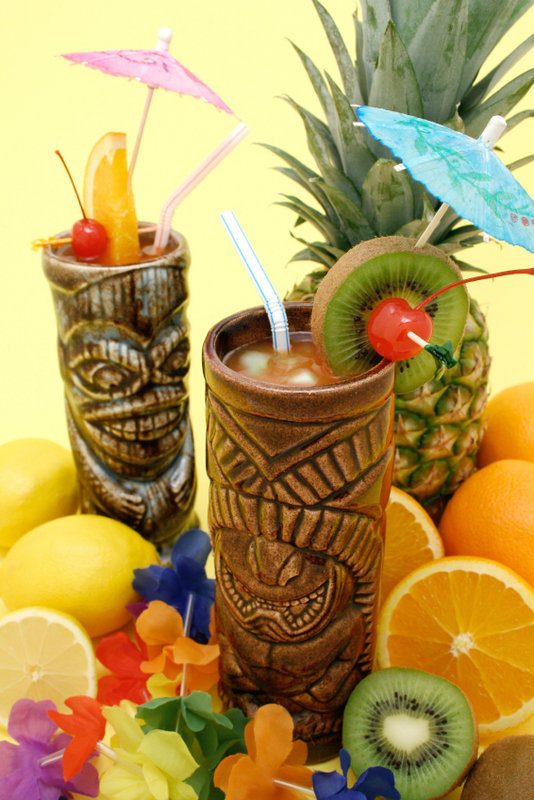 Bring a little bit of the topics home with you and throw a tiki-themed party that your friends will love! Get a few tips and try the recipes in this slideshow. Why do people love Hawaiian drink recipes so much? Perhaps it's because they are so colorful and fruity. You can pair any kind of fruit with a sweet alcohol, like light rum, and you'll have an instant tropical party in a glass. Many Hawaiian drinks are known for having fruit juice or whole fruit in them; this means that they can double as a snack! Remember that it's healthy to eat fruit when it's warm outside since it can help rehydrate your body. When picking a Hawaiian cocktail, try to get something with fruit in it to help your body recover from the alcohol you're drinking. Shake well, and then strain into a highball glass with crushed ice. Garnish with an umbrella or a wedge of pineapple. If you're looking for a darker drink for nighttime, the Dark and Stormy might be right up your alley. And be careful - this drink packs a punch! Stir rum and ginger beer in a pitcher, making sure the mixture doesn't foam over from over-agitation. Pour into a hurricane glass and garnish with a lime wedge. Add all the ingredients and one cup of cracked ice to a blender and blend for 15 to 20 seconds. Garnish with a pineapple wedge and a cherry to complete this treat. Why not bring a little Hawaii home with you? There are countless tiki drink recipe books on the market. In the end, any colorful, fruity drink will work great in a tropical-themed party, but try sticking to drinks that include topical rums for a more authentic spread. Ready for the king of all tropical drinks? Check out a Pina Colada Cocktail Recipe slideshow.